It’s kind of silly that smartphones commonly have as much, if not more, memory than new laptops. It’s also kind of sucky that phone screens commonly ship as 2560×1440, whereas premium laptops are still 1920×1080. Naughtyware. No, not that sort. It looks like some app development may be taking a dark turn. Since ebay has released a new version of its app, the old version no longer works on my phone. I start it, it crashes and then it kindly notifies me that a new version of the app is available. The new version requires the location privilege, where the old location did not, and now to use ebay on my phone I have little choice but to install it and switch off location services while I use it. I was so happy recently to unpack my brand new Motorola RAZR HD. It’s a lovely device. Wonderfully built, with a 4.7 inch 720p screen, replete with Gorilla Glass, and backed by a rubberized kevlar weave. The aluminium strip separating the two, running around the edge of the phone, provides a premium feel. Or, at least, this is what I was led to believe from various reviews. In reality, what you have is a beautiful brick – with good battery life. Android 4.1.2, the operating system shipped with the phone and modified by Google/Motorola Mobility, to ensure the phone is quite unusable, provides an amazing experience – if you connect up your Google account. What happens if you don’t have a Google account, or if you’re unprepared to create one? Before even seeing the home-screen, you are prompted to log into your Google account – or create a new one. You decline. You are reassured that it’s a really good idea to create a Google account, otherwise you’ll “miss out”. Resolutely, you continue. You get to the home screen. Then you want to install something from the Android Market (sorry, “Google Play”). You now cannot avoid creating or using a Google account. The phone is still behaving as though you are not fully connected to Google. Therefore, your data storage is predominatly on the phone only. You have the option of synchronising your data off elsewhere, away from Google’s servers. The CardDAV Sync software on Google Play provides the vehicle for doing this*. You download and install it, set up the sync with your CardDAV server, and sync away. You might find that some of the software from Google updates on your phone during this time, now that it has access to the market. All good… but, you soon come to realise that you cannot add new contacts to your chosen sync location. Take the scenario where you receive an SMS from an unknown number. You try to add the contact from the SMS, and can only do so to local storage. Worse still, your only option to alleviate this – the only sync location you can add contacts to is – that’s right, a/your Google account. If you delete your Google account on the phone, you then find that you cannot sync your contacts anywhere, because you cannot specify a default Contacts Store in the Contacts app. The same is broadly true of the Calendar. If you are not sync’ed with a Google account, the only calendar you can use on the phone is the built-in phone calendar. You cannot use another, third-party calendar as the default store or synchronisation copy. During the course of writing this article, strangely the option appeared in my calendar to utilise alternative calendars when creating an event. We shall see if this persists.. This section has become a total mess in Jelly Bean – especially in Motorola’s implementation. In Settings, you scroll down the list to the Accounts section. Hit CalDAV or CardDAV. You are then taken to the respective app’s account information with a link to Edit account settings. Let’s hit that. .. and hey presto, you’re finally in! Here you make changes and then hit the back key. and then you’re at Settings again, so..
You then have the option: “Add account”, or “Go to accounts & sync”. Let’s say I want to edit an account, I’d choose “go to accounts and sync”..right? I tap it. … and get the options “Sync now” or “Remove account”. So, let’s get this right: to EDIT my app’s data, I go to Settings > Accounts & Sync (not to the app). And when I want to SYNC the account or DELETE it, I go to the app! That’s logical! Android is an open source ecosystem that encourages vendors to produce lock-in experiences which are frustrating, dysfunctional and unintuitive. And to think I was pro-android this time last week. I suppose I still have the t-shirt. The retailer will soon have the phone back, though. *CalDAV sync and CardDAV sync are both great pieces of software that fully get my support (and have done, in the financial sense). I use them here as examples of good apps which are potentially made almost impossible to use by the restrictions imposed by Android OEMs. .. and why you should consider it, or, “…and how to be more efficient”. I’m an avid tasker and a fan of the GTD methodology, but when I use tools that have lots (and lots!) of features I tend to slip up easily and do silly things. An example is adding a repeating task to my task list. A repeating task? Why is this an issue? I simplify this slightly, but in David Allen’s approach to task management, anything that is time-related should be put into a calendar. Therefore, if I am allowed to set up a repeating task, this means I need to do something with a certain regularity, which further implies I must actually do it at some point in order for it to warrant the repetition which I have ascribed to it. In ToodleDo and other “expert” task managers, the ability to manage tasks has advanced to the point where you can essentially control your calendar through your task manager. This approach really suits some people but, to me, this essentially is the tasks-first, time-second approach. It is truly a GTD-esque system and I have had a love/dislike affair with it for several years. I have never “hated” ToodleDo – it’s a great system, but isn’t as integral with my working environment as I would like. To me, tasks should be lean and mean. I don’t really want to spend my time managing them – I want to be doing them. And various factors always weigh in that can be managed outside of my task list. I become less efficient if I start duplicating events into tasks.Part of me loathes the traditional “Weekly Review” of the GTD system. I have a daily review and the most important things are always the ones that get done – it’s a self-managing approach which I’m happy with and doesn’t require over-thinking. Removing the opportunity to over-manage tasks is A Good ThingTM in my book. All I want to do is store my tasks somewhere and interact with them quickly. Using Tasks in Google will accomplish this. Yes, but what about contexts, projects (folders), statuses & goals?! Do lets you live the dream! In GTD, the context of a task is, broadly, how, when or where you might do it. What I kept finding about my contexts, as I was setting them, were that they kept resembling more basic primary situations. For example, I started with “shopping”, “online”, “errands”, “home”, “phone” and “work”. Except, when I started looking more closely, these contexts could be whittled down – and needed to be, in order not to conflict with my Projects/Folders.”Errands” and “shopping”.. well, I would generally be out and about for both of these, so why not make them simply “out-and-about”? This would mitigate the risk of not running an errand while out shopping. Phone calls would typically be work-related, but not always – so I would either make them during work or in personal time. Realising this, I started to see that all of my activities would be split, broadly, between work and personal time. Therefore, if I was working, I would want to make work phone calls. At home, I would want to catch up with my friends online.With always-connected capability (phone, internet, 3G, etc) my contexts eventually became two things: work or personal. That’s it. With a Google Apps for Business account (work) and a personal GMail account (personal), I can separate my work and personal tasks completely. My Folders (“Projects” in GTD parlance) in ToodleDo would typically resemble the types of task I needed to manage. You could argue that this is the wrong way to manage tasks, and instead use Tags for this purpose. While true, Tags are amorphous while Folders are structured and, in ToodleDo, Folders resemble the only way to aggregate tasks into suitably-managed “blocks”.My Folders are things like “cases” (support), “customer/project”, “finance”, “phonecalls” and “systems”. These are unlikely to change as they closely match my general daily activities. Google’s Tasks can accommodate this with top-level lists. Within each list, I can have a task (with indented sub-tasks) which allows enough manageability without overcrowding my senses with due-dates, contexts and estimated duration. This is a real easy one and probably the one thing I disagree with GTD about. The overall status of my tasks is logical: either incomplete, or complete. If I am waiting on somebody, I will already know this. If I am doing my task, I will probably know this too!But what about if I wish to do my task “someday“? Well, shocking as it may sound, but that’s how I view all my tasks. They are things to be done, sooner rather than later, but someday is the best I can plan for. And this is what it’s all about: planning effectively. Therefore, to have a status of “planning” seems idiotic: unless I’m actually doing a thing, I’ll probably planning to do a thing!This is the key: the status of a task in GTD could be mistaken for the status of a person – you. If my status changes, that might mean my ability to do that task is deferred. That doesn’t mean I won’t do it, or that the task somehow becomes like me and is also unable to do anything until another time (such as when I am well, or back from a holiday, etc). …. I include here as a passing reference. One aspect of goal-setting is the ability in ToodleDo to track progress on tasks relative to goals set. In this regard, Google’s Tasks is clearly inferior. But managing goals can exist outside the context of a task management application and, I argue, it should. If goals are important, one’s whole life should be managed into achieving them. Well, actually, they didn’t really say that. I did. But it’s true – it couldn’t be done, easily, until now. * I have only used this on Android 4.1 and have set up both of my Google accounts as sync accounts on my phone. As always, your mileage may vary. Install the Astrid app on your smartphone. Still in the Astrid app on your phone, go back to the Sync & backup settings and select Astrid.com – ensure that you can log in using your astrid.com account credentials. Run a sync on the phone (menu > Sync Now) – this will sync your two task lists (Astrid and Google). Now, log in to ToodleDo in your desktop browser and navigate to Tools > Import / Export / Backup and select CSV Import / Export. Choose to Export all incomplete tasks. You can also export all completed tasks if you want, but there’s no point syncing them (IMHO). 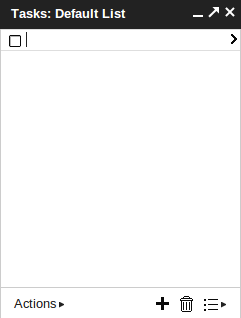 In the next page, use the drop-down to select ToodleDo. Back on the phone, tap “Sync now” again. Voila! Your original tasks are now in Google Tasks! A telescope for Christmas is one of the best presents a boy can ever have – even one in his thirties! This “kid” here was the lucky recipient of a Sky-Watcher SK1309EQ2 – the first reflecting telescope I’ve owned. Using a reflector is really straightforward and a lot of fun. Learning the difference between an equatorial mount and an alt-az mount is really the first order of business. Comprehending how to manage mounting the ‘scope, and tracking celestial objects as they circumnavigate the night sky, helps in understanding one’s position on the planet in relation to these heavenly bodies. As you start spending time watching the night sky, your eyes become more sensitive to it. Focus on a particular area and, over time, more stars emerge. As I’m discovering, training the eye is as important a task as focusing the viewfinder. Capturing the image is somewhat more of a challenge. Have a look at my first photo album of moon shots – taken with a dash of luck through the camera lens of a Samsung Galaxy S mobile phone, pointing straight into the telescope’s eyepiece. The best part of using a telescope, though, is sharing the experience. Luckily for me, that means spending more time with the beautiful girl who was so kind to buy the device. This problem has been reported for other systems – Jayway covers 64-bit Ubuntu, which is where I derived most of the info I needed (thanks guys!). Yum will pull in the necessary dependencies. Restart Eclipse and the error should disappear.